For us, the Fourth of July is a perfect way to celebrate summer and our country – complete with food, friends, and fireworks; but for our pals, it’s a random onset of loud noises and bright flashes of light for apparently no reason. 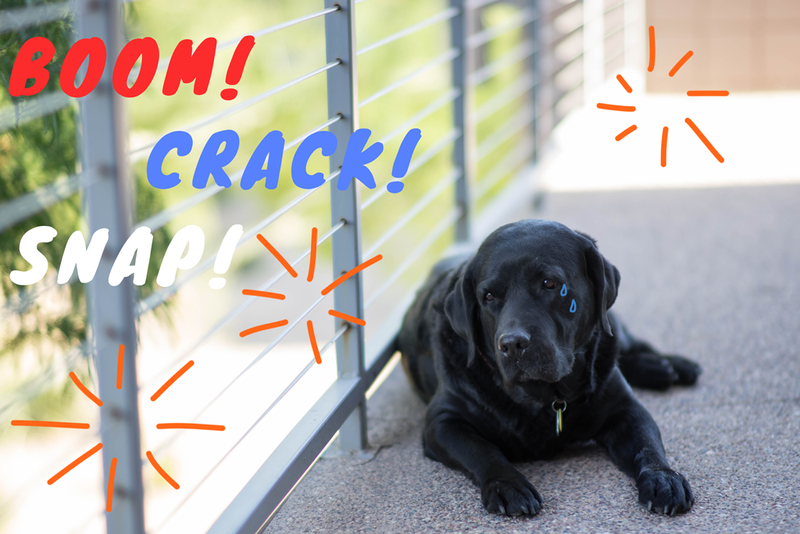 With all the pops, booms, and bangs it makes sense that pets would make a break for it, which is how July became Lost Pet Prevention Month – because shelters see an influx of occupants on July 5 due to the previous night’s festivities. Don’t let your pet be part of the crowd – here are a few ways to ease their fears and keep them safely at home. Designate a Space. Give your pet their own room or area, preferably as far away from the noise as you can, and let them relax there. Put a few of their favorite things in there and politely request that guests leave the door or gate closed. We suggest popping in on your pal as a reminder that they’re not forgotten and you’re alright, but only if it will calm your pet and not worry them more. Quick Tip: Just in case your pet isn’t wearing their tags, gather any proof of ownership you may have, be it a vet bill or adoption papers, as you’ll need some way to try and prove that they’re yours. Anxiety Control. Consider a little extra help, as more and more products are emerging to calm anxious pets. One of the originals is an anxiety wrap – a swaddle-like concept that hugs your pal in the right places to make them feel safe and secure. Even if you only use it a few times a year, calming their anxiety makes any situation much easier for both of you. Get ‘em Tired. Before all the fun, try tuckering your pet out with a run, swim, or long game of fetch (or feather chasing) so that they’re too tired to get worked up. This one can be tricky in the July heat so try to go in the morning to prevent anyone from overheating. BE SAFE. Fireworks are dangerous for pets and humans alike; please be sure whoever is lighting and extinguishing the flames is using the proper precautions and that all pets are inside for the firework display. Even if they aren’t jumpy, some dogs’ prey drive could kick in and cause them to run after flame. Make sure guests are respectful of your pals by keeping all doors and gates securely closed and keeping food and bones out of their reach. We hope you have a safe and fun-filled Fourth of July! Show us your patriotic pals celebrating on Facebook!